Create an illustration to present in a fancy our ticket desk. We are a shuttle bus company. We bring our customer to airports from many train stations in Europe. 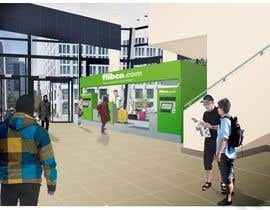 We are going to create a ticket desk in one train station and we need a nice illustration to present how the this desk could look like. This illustration doesn't need to be extremely precise in terms of dimensions, because we just need it to add it into a presentation to present the idea. It is not a plan for company who have to build it. 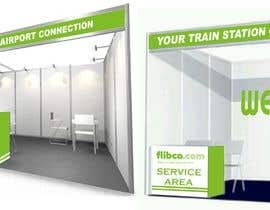 - some pictures of the corner of the train station where it will be hosted. 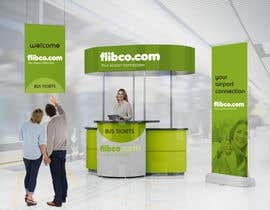 Could you please create an illustration which show a ticket desk with our colors, and similar to the description and an environment which is similar to the fotos of the train station? Wait for my full entry. Hi there! do you need a similar illustration that you provided, right? do you have a preferred style? realistic like the sample or would you like if it's more cartoony? I will submit. no finish yet. Hello, I am sorry but I don't know exactly what you mean "guarantee". What does it mean in the freelancer world? I have done some reasearches and I understood what you mean. I just did it. yes we will wait 2 or 3 days. Hi, interesting project, but I think the attachment of the plan is missing. Please upload it. Thanks. Working on. Please wait for my entry.